I shared my thoughts on the Beautiful Creatures Movie last week but I also want to share my thoughts on all of the Caster Chronicle books (that’s what the series is called) in this awesome series. And since I can’t control my crafty urges I also have a tutorial on how to make your own Lena Duchannes necklace just in time for you to wear it to the movie which opens in theaters today. And because I can’t help but share my geekiness I’m giving away a bunch of Beautiful Creatures swag and Lena necklace. Scroll down for more details on the giveaway. After watching the movie I had an even deeper appreciation for the complexity of the story. Guys it is SO much better and deeper than the movie does (or even could) get across. The story is told (mostly) from Ethan’s perspective (yup a male POV) and the romance and friendships are smart and fun. Ethan and Lena are such a sweet couple and they struggle through so many hoops to be together and help each other through various trials. Oh and by the way they can kelt or mindspeak with each other, it’s kind of awesome. Link is possibly my favorite best friend/side kick character I’ve come across. He’s totally boy, totally loyal and surprisingly a great guy. Also there are all these side characters that are wonderful and I know would never make it into the movie just for the sake of time. But their insight and humor had me grinning constantly while I read. Some of my favorites are Ethan’s great aunts who are just ridiculous and endearing. All the characters are beautifully multidimensional. They struggle with who they are, they aren’t totally good or bad, they grow, and they work together. But besides great characters the story is lots of fun. I listened to the first book, Beautiful Creatures, and was immediately drawn into the story. Witches, or rather Casters in an every day American town in the South with Civil War flashbacks was a setting that I loved. If you know me you know I’m all about kids with powers and even better if it takes place in a school setting. The first book didn’t blow me away but I definitely enjoyed it and the audiobook performance is great. The second book, Beautiful Darkness was my least favorite but I still really liked it. More characters were introduced and I became even more attached to the ones I had already met. But the third book Beautiful Chaos, absolutely stole my heart. Seriously. I love love love this book. The characters ALL grow by leaps and bounds and the depth of the story multiplies. It’s fantastic. Book three leaves you with a cliffhanger though so you’ll want to have Beautiful Redemption waiting on the deck. And I can say the final book of the series did not disappoint. It’s a totally different book than the others but in a really good way that makes the story fresh. The direction is completely different than where I expected (and have seen other books) take the story. And it’s a very cool direction. Lena’s necklace is an image that stands out in the books. Through out each of the she adds to her necklace. I knew right away that I wanted to make my own version. You can make one to symbolize things that are important to you but I decided to try and duplicate Lena’s as well as I could. I included: locket, seashell, soda tab, red string, plastic ring, bird charm, smashed penny, star made from a paper clip, rose pendant, treble clef charm, safety pin, black stone (and I want to add a piece of sea glass and a silver button). Are there any other treasures you can remember that I left off? Most of the trinkets could just be strung onto the chain but for the others I either made a hole or glued a ring to the item. And just for fun I’m giving away all a bunch of Beautiful Creatures goodies. A movie poster, a few bookmarks, themed candy, shirt, and a Lena necklace. Click here to enter the giveaway. Oh my goodness Marissa!! I love this necklace so much!! It is so sweet! I can’t think of any charms you left off either. Too cute. Argh autocorrect!! I meant Marissa! I really need that necklace. Are Yoy going to sell them in the store?? Hi. I just read your About ME page linked to Cheerios & Lattes. I love HP, too! I’m now following you. 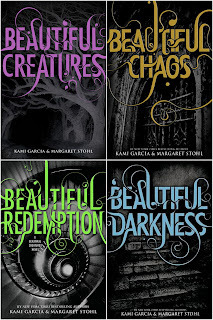 The four Beautiful Creatures books are on sale for Kindle today for $2.99 each, so I bought them all. I hope I enjoy them as much as you have. And I hope I can find a theatre here in Costa Rica that shows the movie in the next couple weeks. Have a lovely reading week! Are you going to go see the Beautiful Creatures movie?? What a fun necklace! I am 61% (I have a kindle that tells me the % ha!) and I’ll be seeing the movie on Saturday. I’m excited! I’ve been reading Antifragile and I posted about it on my blog yesterday. Still not really sure I understand it, but it is very cool. These were great books. I love the idea for a charm necklace like this! Nice review and lovely necklace. I’m a new follower. Hope to read Beautiful Creatures series this year. I love that necklace idea!! Thanks for sharing this at Romance on a dime!! Cute necklace. Your design stayed true to the book. Unlike the movie. I thought the great aunt were adorable too. I made an art print inspired by the book. Check it out if you have time. LOVE LOVE LOVE the necklace Marissa!!!!! I’m going to have to read those books!!! I love your necklace! It’s creative :) I’m gonna make it. Love all your creations! She adds a ring in the second book it is a ring that is bronze silver and golf twisted it’s his moms ring he gives her .